part is called the saddle. The saddle is stamped with the diameter of the wire rope that the clip will fit. Always place a clip with the U-bolt on the bitter (dead) end, not on the standing part of the wire rope. When clips are attached incorrectly, the standing part (live end) of the wire rope will be distorted or have smashed spots. A rule of thumb to remember when attaching a wire rope clip is to "NEVER saddle a dead horse." Another type of wire rope clip is the twin-base clip, often referred to as the universal or two clamp (fig. 5-9). Both parts of this clip are shaped to fit the wire rope; therefore, the clip cannot be attached incorrectly. The twin-base clip allows a clear 360-degree swing with the wrench when the nuts are being tightened. 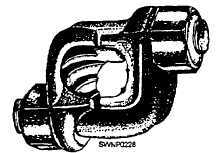 Wire rope clamps (fig. 5-10) are used to make an eye in the rope with or without a thimble; however, a clamp is normally used without a thimble. The eye will have approximately 90 percent of the strength of the rope. The two end collars should be tightened with wrenches to force the wire rope clamp to a good, snug fit. This squeezes the rope securely against each other. When an eye is made in a wire rope, a metal fitting, called a thimble, is usually placed in the eye (fig. 5-8). The thimble protects the eye against wear. Wire rope eyes with thimbles and wire rope clips can hold approximately 80 percent of the wire rope strength. Figure 5-9. - Twin-base wire rope clip. Figure 5-10. - Wire rope. After the eye made with clips has been strained, the nuts on the clips must be retightened. Checks should be made now and then for tightness or damage to the rope cause by the clips. A wedge socket end fitting (fig. 5-11) is used in situations that require the fitting to be changed frequently. For example, the attachment used most often to attach dead ends of wire ropes to pad eyes, or like fittings, on cranes and earthmoving equipment is the wedge socket. 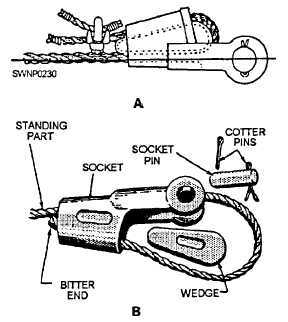 The socket is applied to the bitter end of the wire rope. Fabricated in two parts, the wedge socket has a tapered opening for the wire rope and a small wedge to fit into the tapered socket. The loop of wire rope must be installed in the wedge socket, so the standing part of the wire rope will form a nearly direct line to the clevis pin of the fitting. When a wedge socket is assembled correctly, it tightens as a load is placed on the wire rope. Figure 5-11. - A. Wedge socket B. Parts of a wedge socket.